This past week, bow hunting season opened up. This summer was not much to speak of, and it seems fall got an early hold on us all up in the Hayward area. The trees are coloring fast, faster than I can remember, and there is a crisp chill in the air. Over the weekend, we sat in the stand waiting to see if any deer would cross our path, but I think they all went south for winter (at least it seems). Although I’ve been seeing quite a few large does lately, this year they are off limits, due to the harsh conditions the herd has had to endure the past few winters. I’ve never liked heights much, but the older I get, the fear seems to intensify, and the first time up and down the ladder to the stand makes me almost woozie. Finally, when I reach the top and climb into the firm footing of our nice stand, I can feel a little relief. I don’t know how you guys can sit up in those open, moveable tree stands! 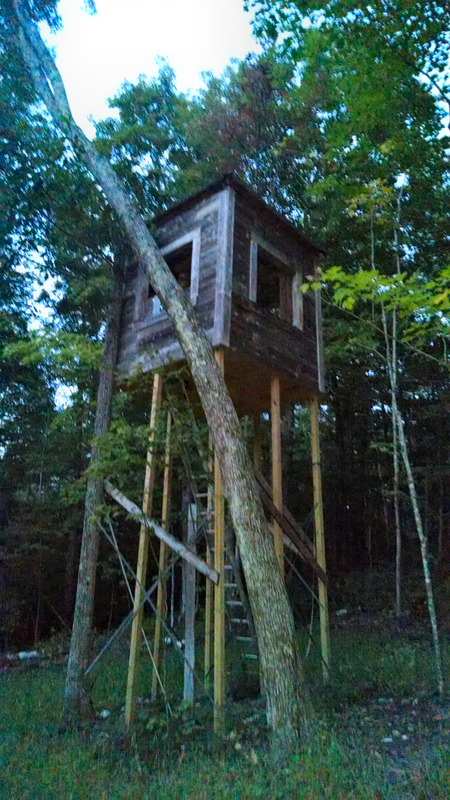 This entry was posted in Hunting, NORTHWOODS LIFE and tagged bow hunting northwest wi, bowhunting hayward wi, cool deer stand, deer hunting hayward wi, deer stands. Bookmark the permalink.